La Tania: A new "magic carpet" conveyor belt type lift has been put in place for the kids to use in the centre of the resort next to the Troika drag. They've also widened this area which is completely seperated from any through ski traffic. Les Menuires: The Beca drag lift and the two Combes drag lifts (Combes A and B) are replaced by a high speed detachable 6-pack chair. This new lift gives access to the east side of the Mont de la Chambre and should allow access to the Grand Lac & Pélozet blue runs making it easier and faster to make it over to Brewskis in St. Martin de Belleville for a late lunch after spending the morning in Val Thorens / Les Menuires! Val Thorens: A third Funitel - Bouquetin has been built in the Val Thorens area at a cost of £3.2m. It's like 3 big gondolas joined together which move up as 3 come down just like a cable car works. It's got dual wires and I guess it's designed to stand the high winds you get up there. What a central pylon too - definitely an entry for pylon of the day! This will give access to the Mont de Peclet link and in to the Méribel valley on the Lac de la Chambre red run. This should iron out the traditional bottleneck of the 3 Vallees 2 chair in the late afternoon rush back to other Three Valleys resorts. Details of a new planned chairlift in La Tania along with a new beginners piste have reached us. A copy of the plan is now here. Rumours of lifts from Bozel and/or St Bon continue but without much substance. Stories of a planned lift out of Le Raffort up to the Olympic quad chair and the planned replacement of the Plan de l'Homme slow quad chair out of Le Chaudanne in the centre of Méribel are also circulating. Also above 1850 are improvements to the Slalom stadium including a new sound system, timing devices, control huts and 11 new snow cannons, further improvements to the Pralong beginners area and a new piste has been created that goes over the road just before 1850 to link 1850 to 1550 from the bottom of the 6-man Pralong lift - doesn't look like this will be completed in time for the snow this season though. Finally, four new Gazex avalanche control systems around the Chanrossa chair have been installed - this will allow quicker opening of the great Creux bowl after heavy snow falls. Some vicious speed bumps on the main road through La Tania have been installed - you definitely have to slow down due to them! New street lighting is also being installed. New for this summer on the Troika run with a tarmac base - Looks like it just packs away for the Winter! Of course the Olympic Ski Jump is used in the Summer - they land on the Astroturf type material when there's no snow - but for this summer a jump in to the lake for practicing those aerial manoeuvres and not getting hurt has been built. All the lift pass details for 2003/4 season are now here. A 6 day Three Valley adult pass is now €198. Confirmation that a 6-day or more Three Valleys pass will give a free day to the new linked area of La Plagne / Les Arcs - named Paradiski. 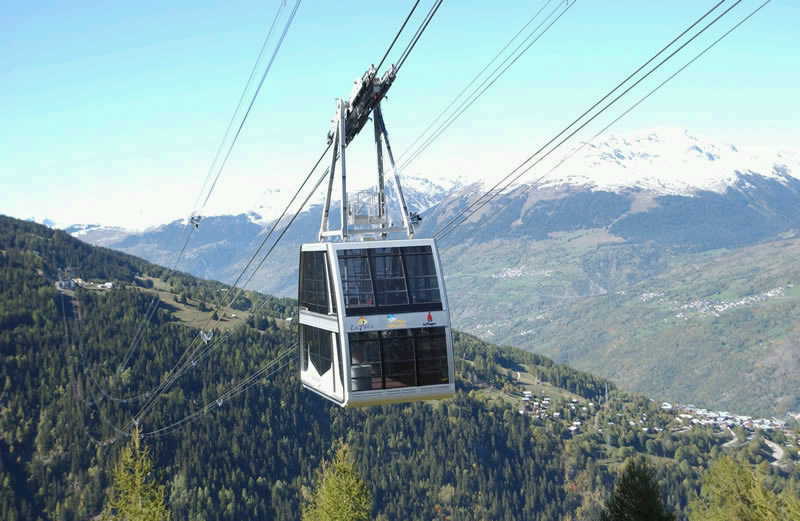 The new double-decker, 200 person cable car, the Vanoise Express is scheduled to open in December 2003 and links the 2 areas together 1500m above the valley. 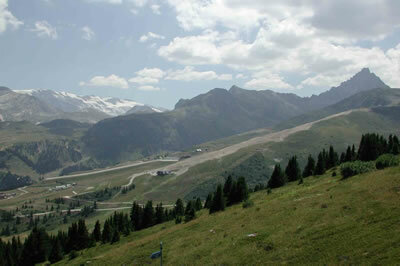 Remember that Champagny also links in to this (the 2nd biggest ski area in the world!) and is only a 20 minute drive from La Tania - there'll be a lift one day apparently. No doubt we'll be checking it out and going the furthest distance (and back) possible in a day. In testing they managed to crash the cable car straight in to the station at 20km/h!!! A few more Chalets going up (as usual!). While 1850 got Broadband last Winter, Val Thorens will have wireless high speed internet access this Winter. Initially in the tourist office hall, this will be the highest WiFi installation in Europe. New Beer in the Ski Lodge! Locally brewed Tarentaise Bitter will be on sale next season from the new British run micro brewery near Moutiers. La Tania locals received a special tour and tasting during the summer and certainly gave it the thumbs up.